NEW YORK (Reuters) - Hip-hop artists Macklemore & Ryan Lewis scored the most American Music Awards nominations on Thursday with nods in six categories, followed by country-pop star Taylor Swift and singer Justin Timberlake with five each. The duo will compete in the top category, artist of the year, against singer Bruno Mars, Swift, Timberlake and pop singer Rihanna, who collected four nominations. Also getting four nominations were country music pair Florida Georgia Line and R&B singer Robin Thicke. 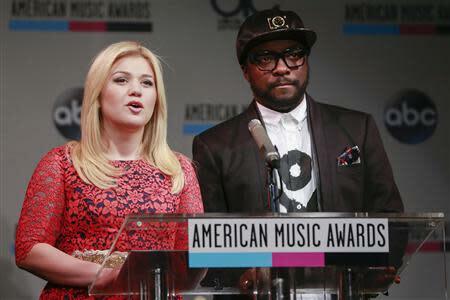 Rapper will.i.am and singer Kelly Clarkson announced the names of the nominees in five of the top categories on Thursday on the ABC television network news show "Good Morning America." Macklemore & Ryan Lewis also received nominations for the coveted best new artist award, the single of the year for "Thrift Shop," favorite pop/rock band, and best rap/hip-hop artist and album for "The Heist." "This year's lineup of talent is truly very impressive," Larry Klein, the producer of the AMAs, told a news conference before the final categories were announced. Last year's big winner, 19-year-old teen heart-throb Justin Bieber who took home three awards including artist of the year, failed to receive any nominations. Florida Georgia Line, pop singer Ariana Grande, alternative rock band Imagine Dragons and Phillip Phillips, the winner of the 11th season of the TV singing competition "American Idol," will also compete for new artist of the year. "Thrift Shop" featuring Wanz will vie for the best single against Thicke's "Blurred Lines" featuring Pharrell & T.I. and "Cruise" by Florida Georgia Line with Nelly. Thicke, 36, also earned a nomination for favorite soul/R&B male artist alongside singer Miguel and Timberlake, while Ciara, Alicia Keys and Rihanna will battle it out for the top female soul/R&B trophy. Rihanna will also compete against Swift and singer Pink for the top female pop or rock artist prize, while Mars is pitted against Thicke and Timberlake for favorite male artist in the same category. Mars and Imagine Dragons each received three nominations. Former Disney star Miley Cyrus, 20, who caused a sensation with her raunchy performance at the MTV Video Music Awards in August and just released her new album "Bangerz," and Imagine Dragons will perform during the awards show. Winners of the AMAs will be selected by fans through online voting, which starts on Thursday, and for the first time this year via Twitter. The awards will be presented on November 24 at the Nokia Theatre in Los Angeles and will be broadcast live on ABC and streamed online.